Arizona whitewater rafting is known and loved for being the first rafting opportunities each spring in the U.S. thanks to the early snowmelt in the Arizona mountains! Arizona rafting adventures offer a truly unique experience; with the gorgeous high desert scenery and wildlife and the chance to really get away from it all on remote wilderness trips. It’s great for those itching to get on the river, or wanting to ski one day, and raft the next! Arizona rafting trips are located within a few hours of both Phoenix and Tucson. Discover Arizona’s best kept secret: The Upper Salt River Canyon! This whitewater river rafting gem is located just 2 hours from East Phoenix and North Tucson. Known as the mini-grand canyon, with an early spring season, the Upper Salt River Canyon should not be missed for river enthusiasts or first timers alike. 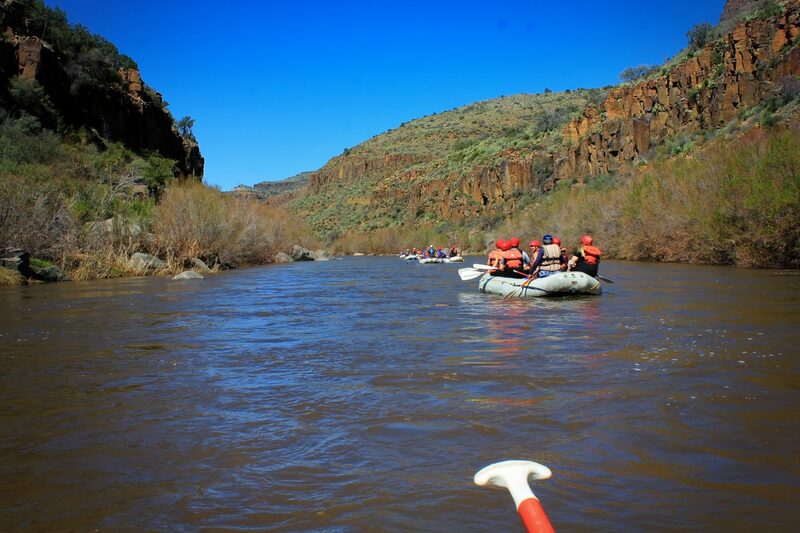 Challenge Arizona Rafting and exciting rapids in this 2,000 foot deep canyon. Paddle past towering rock walls and through exciting Class III rapids on the partial and day trips (with rapids every 5-10 minutes) and Class IV on the overnight trips, 2-day to 5-day. The further you go into the Salt River Canyon, the more you will be in awe. Experience exhilarating Salt River Rafting, Arizona’s best kept secret, on a guided raft, inflatable kayak or a smaller adventure boat. Arizona’s only Federally designated “Wild and Scenic” river, the Verde River, with it’s variable spring season, is a trip to experience if you can catch it! With the “Wild and Scenic” designation, you will be treated to amazing scenery and wildlife. The canyon illuminates spectacular golden, red and brown hues. Wildlife sightings include beaver, bear, river otter and the most varied bird life including blue herons, red tail hawks and golden and bald eagles. With the river dropping 20 feet per mile, tackle the rapids in a guided raft, or in your own inflatable kayak under the supervision of our instructor. Because the Arizona rafting season on the Verde River is short, and unpredictable, if you have set dates needed for your departure, Salt River Rafting is a better option. This trip is conveniently located in close proximity to Sedona, Arizona. Both Salt River Rafting and the Verde River are perfect backyard adventures for locals and visitors. Whitewater Rafting Arizona: The Best in the West!